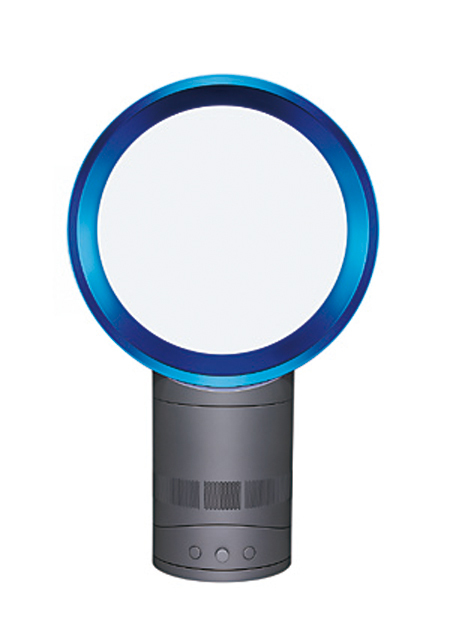 "Air multiplier", introduced in 2009, is an innovative "bladeless" fan that uses "air multiplier technology" (the surrounding air is engulfed in a circular current of air, causing a current 15 times bigger) originally developed by Dyson, known for their cyclone vacuum cleaner. The wind is not caused by the rotating blades, allowing for the smooth deliverance of air. There is no danger of small children getting their fingers hurt, so the hassle of taking the cover off to clean the blades is eliminated. There are two sizes for the circular part that is producing the wind (25cm or 30 cm), and there are also two color variations (silver inner ring/white body or satin blue inner ring/iron body). Both colorways gives the feeling of cleanliness and advancement. The styling, when first looked upon, does not resemble that of a fan. It resembles an objet d'art or a trophy, and brings relaxation with a pleasant wind that seems to flow from out of nowhere. It is truly a product with a mysterious impression. In recent years, fans are not only often used during the summer but also in winter to unify the temperature of the rooms. For this kind of lifestyle, the "air multiplier" is sure to become active regardless of the season, and can be expected to drive the rich life of the near future.